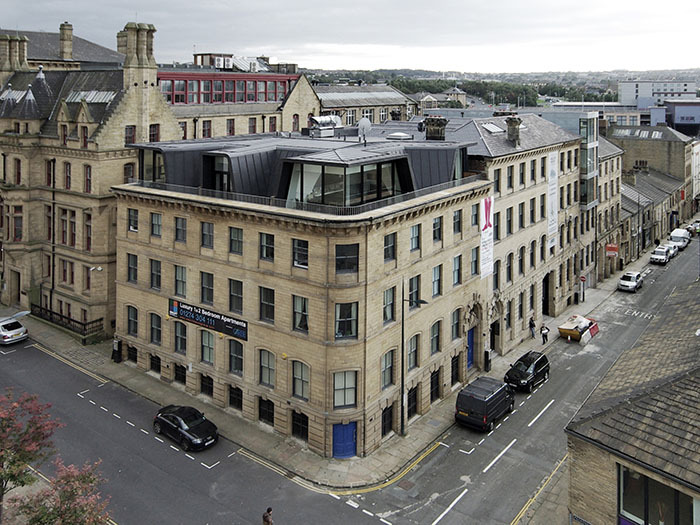 Development of the grade II listed Tayson House involved the refurbishment and new extension of a Victorian warehouse building. In the 19th Century, central Bradford attracted a merchant German community that gave rise to the formation of Bradford’s ‘Little Germany’. The formation of Bradford’s Little Germany took place in various stages which can be seen in the different sizes of the warehouses. Starting with two to three storey buildings in the early 1830s, the trend changed towards grander structures in the late 1850s. Tayson House was built around 1870 and its four floors have a two storey neighbour. The new infill structure tries to mediate between the two historical buildings, making a clear statement in its own time – the present. The new extension is hung from a steel frame creating a minimal interface with the existing buildings. By creating its own architectural language, the glass, galvanized steel and timber structure can be seen as a separate entity. This allows a continuation of the industrial character of Little Germany and helps to regenerate the area. The industrial legacy of little Germany in Bradford, with ornate sandstone façades and cast iron metalwork, led to the choice of a cladding material in galvanized steel. The galvanized steel façade consists of 3mm steel plates which are folded around the corners of the new extension. The aim was to give the structure a similar solid appearance as the surrounding buildings, avoiding cladding joints as much as possible. The new structure retains a certain autonomy by cantilevering over the front and rear façade and thus being easily visible from the street.